PAX 2011: "Dungeons and Dragons Is Like Gospel Music"
Dungeons & Dragons has changed a lot over the years, and some of the biggest authorities on the game recently reflected on its ongoing evolution. Since Dungeons & Dragons was first published in 1974, it's been a major force in gaming. That said, the RPG (and its various campaign settings) have undergone some major changes over the decades. 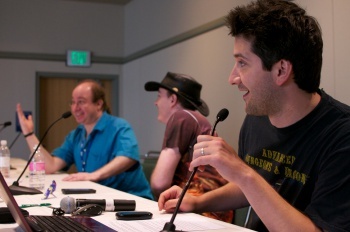 As a result, The Escapist's own Greg Tito hosted "Dungeons & Dragons Through The Ages" a PAX Prime panel that looked back on the game and its evolution across the years. Aside from Mr. Tito, the panel featured some pretty big authorities on the subject. There was Keith Baker, creator of the delightfully macabre card game Gloom and author of "Have Dice, Will Travel" on The Escapist; Mike Selinker, a D&D 3rd Edition creative director who was also at Paizo for the launch of Pathfinder; and Mike Mearls, Senior Manager of the Dungeons & Dragons Research and Development Team. The first - and biggest - issue that was addressed was about how there have been four different editions of D&D; namely, what led to the changes. Each panelist had different answers along the same idea: Essentially, new versions of the game allowed for more complexity and detail to be worked into it. Baker explained that D&D's origins laid in it being a miniatures game, though it transitioned to include more adventure. Mearls, meanwhile pointed out that "the story of D&D changing is the story of it getting more complex." On top of this, it was pointed out that the additional complexity was comparable to videogames over the years. Mearls pointed out that comparing the First Edition to the Fourth was like comparing the original Bard's Tale to Mass Effect. However, Selinker had the most unusual way of phrasing this perspective on D&D's new editions adding more rules and details: "Dungeons & Dragons is a little like Gospel music, it reaches out and grabs everything. It says 'I can make me sound like that.'" While the new versions of the game keep giving players more options and ways to act out their fantasies, it was also pointed out that some folks keep on returning to older Editions of the game. In a nutshell, this is probably due to the fact that these older models provide much simpler and rewarding play experiences, partially because there aren't so many rules in place. Mearls pointed out that removing rules from the game could actually create a more rewarding story: "In the older games, the DM has the ultimate authority. If you're playing the original D&D, there are no rules for climbing or jumping or swimming. Instead, you had to convince the DM to let you do that. In some ways, that's the core essence of a tabletop RPG: the DM." "The decision of which edition you play depends on which one your Dungeon Master wants to play," Selinker noted. "The presumption is that the Dungeon Master either finds something lacking in the current Edition or finds something greater in a previous one. I don't see how that could be considered a wrong decision." Now, even though the rules have changed over the years, the default settings and environment have generally stayed the same. However, there has still been an evolution to these elements, thanks to the changing taste of the general public. Selinker made a point of highlighting that the world of Greyhawk defined situations for the First and Second Editions. However, the Third Edition switched over to Forgotten Realms. Mearls noted that this is (at least partly) due to the fact that the fantasy genre has changed a lot over the years, using the Penny Arcade Expo as an example: Essentially, if the show had been taking place thirty years earlier, he pointed out that there would be a lot of people cosplaying Michael Moorcock's celebrated character Elric. Gary Gygax once said "don't spend too much time merely reading. The best part of this work is the play, so play and enjoy!" His words are still valid, perhaps even moreseo today because of the expanded rules that continue to be added to Dungeons & Dragons. Baker himself summed up the strength of this logic simply and eloquently: "the DM may have narrative power, but you don't know how it's actually going to end up." Selinker, in turn, noted that DMS are the "ultimate arbiters of fate." However, they also have to be good storytellers capable of improvisation because, "things don't always go according to plan... rules and story provide a box that you can do a lot within, but you can't do a lot outside of it because you don't know what to do." Finally, the trio speculated on where they envisioned Dungeons & Dragons in five years. The common consensus was that the game's increasing complexity will allow it to continue delivering play experiences that are more customized to the folks who are playing it. Mearls likened it to a DVD player, comfortably allowing gamers to play whatever they want. Selinker, meanwhile, summed up the game's potential in an abstract, yet definite, manner: "It can be all the things that it's become."